Relentless Financial Improvement: Where is your money going? "I just don't know where all of my hard earned money goes." "I have no idea how much money I have. I only find out when I get my bank statement each month." "I opened my credit card statement and I could NOT believe I spent THAT much on eating out this month!" "I want to start budgeting someday." "I have so much debt I don't know how to pay it off." How familiar do these statements sound? The first step in saving is getting a grasp of how much money you have, and where that money is going. Most people don't know how much money they truly have and how much debt they are truly in. Most people spend money blindly and don't have any plan of action on how to save or invest their money. Think of running your life like a finely tuned and efficient business. Would you shop from a store that didn't keep track of inventory? Would you invest in a company that doesn't keep track of profits and losses? If you want to improve your finances, this is one of the first steps. If you don't document and monitor where your money is going, you will have no idea how to control and grow your money. "But I don't have TIME to budget." Yes you do. I'll show you how easy it can be. "But I don't want to bother with saving money." Get off my site. There are many different ways to track your spending. I use 3 different methods (I'm a freak). Mint is the easiest way to keep track of your spending. 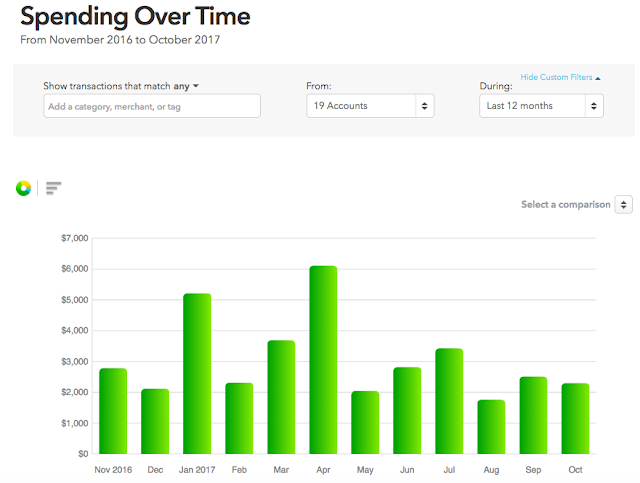 You simply input a login of all of your accounts: checking, savings, credit cards, IRAs, 401Ks, taxable investments, mortgage, properties, vehicles, etc and then Mint will systematically categorize how much you're earning and spending in various categories such as: bills, shopping, paycheck, groceries, dining, etc. It does this all automatically but does require some fine-tuning every now and then. Mint displays the Zillow value of any property you own. Mint also provides you with a free credit score. There are very few downsides to using Mint. Mint does not link with every single financial institution out there, so you may have to manually input certain account balances. Also, Mint only posts which transactions have gone through. For example if you've written a check or scheduled a bill payment, you won't be able to track this expense until the check or bill payment has been cashed. This is why I use ClearCheckbook to manually track my expenses (read more below). If you are looking for a simple and automatic way to track your income and expenses, Mint is the way to go. Personal Capital is a financial account aggregator such as Mint that offers free financial tools to help you manage all of your finances in one place. The advantage that Personal Capital has over Mint is that it is more heavily geared towards tracking your investments and net worth. Personal Capital does an excellent job monitoring your investment portfolio. It’s easy to find information regarding your investment asset allocation and investment fees. Personal Capital also offers a simple to use retirement planning software. Personal Capital’s retirement planner is extremely easy to use. You simply input your investments, savings, risk tolerance, desired monthly expenses in retirement, and your desired retirement age. The planner allows you to plan for and add large upcoming expenses such as a home purchase or college tuition. You can also add projected income events such as projected Social Security distributions, rental income, pensions or inheritances. The retirement planner then calculates your likelihood of successfully retiring when you want to. You can adjust factors affecting your retirement with the planner such as your savings rate and annual expenses. The planner then provides you with instant feedback on how those changes affect your finances. It’s nice to get a look at the big picture of your odds of successfully retiring. I have not found a better retirement planner out there compared to the one that Personal Capital offers for free. Like Mint, there are some financial institutions that Personal Capital does not like with. In these instances, you will have to manually input account balances if you want Personal Capital to track these accounts as part of your net worth. Once you hit 100K of investable assets, a licensed financial advisor from Personal Capital will call you and see if they can schedule a free telephone consultation. The advisor will take the time to discuss your financial goals and questions. They will also discuss ways to improve your portfolio, reduce your fees, reduce your risks and optimize your taxes. There is no obligation to speak with them and the phone call is free. Personal Capital does offer professional investment management if you are interested. I highly recommend checking out Personal Capital and playing with the investment analyzer and retirement planner. You can sign up for your free Personal Capital account here. For those looking for a manual way to balance accounts, I highly recommend ClearCheckbook. 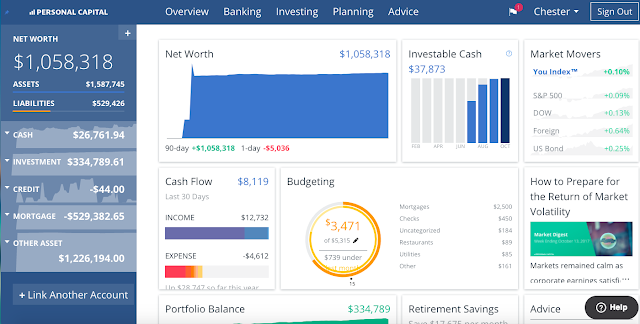 ClearCheckbook is a free online personal finance web based application that has the ability to help manage every aspect of your financial accounts. 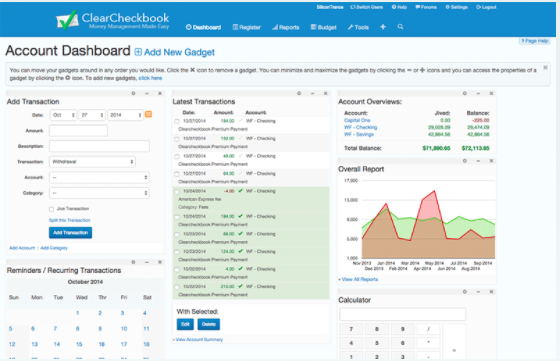 ClearCheckbook can keep track of all your checking, savings, credit cards, investment accounts, and more. You enter all of your account expenses manually, so ClearCheckbook does not store any of your bank or credit card information. You can access ClearCheckbook any time you have internet access. There is an iPhone app, but I find the webpage much easier to use. Anytime I move money around, such as use my credit card, schedule a bill pay, write a check or use any cash, I immediately document it online with ClearCheckbook. This only takes a moment. I do this right away because I know that I am lazy and I will not sit down and look at my receipts at a later time. I categorize all my difference types of expenses. This helps me monitor which areas I spend the most money on over time. You can easily search prior transactions. While Mint and Personal Capital can automatically track expenses, ClearCheckbook allows me to keep track of which checks have cleared as well as total restaurant expenses including tip. When comparing my credit card statements against my manually documented transactions, I’ve caught small instances of fraud such as when a waiter deliberately modified my tip amount and overcharges my credit card. When comparing my bank statements, I can track down which checks haven’t been cashed yet. ClearCheckbook is my favorite way to manually document all of our income and expenses. I track all of my spending with Mint and ClearCheckbook. I track all of our investments with Personal Capital. Start documenting your expenses and income. You know that you've procrastinated long enough. You will find that once you start keeping track of your money, it will be like second nature to categorize every expense in it's own category. Who knows, you might enjoy it. You will be surprised to see just where exactly your money is going. Tracking what you spend isn't the secret to saving money, just like counting your calories isn't the secret to losing weight – but it’s a good start.